Factory assembled contract furniture with the following specification: Carcase: 15mm Melamine faced particle board. Construction: Glued, dowelled & screwed. Metal KD fixings. 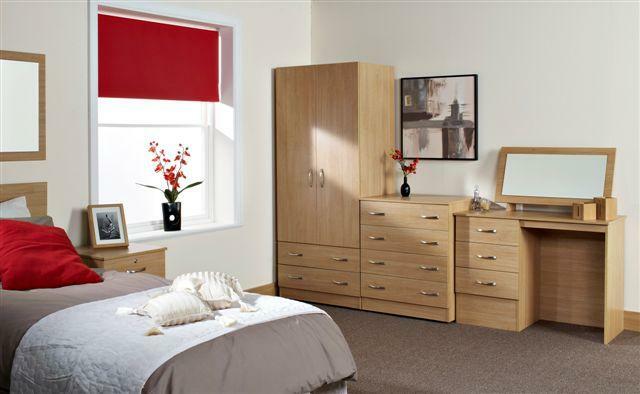 Chest & Bedside Tops: 15mm Melamine faced particle board with 2mm lipped edges. Backs: Solid 15mm matching backs melamine faced particle board. Drawers: Metal sides with easy glide rollers, 15mm solid drawer bases and back rails. Hinges: 90 degrees all metal. Handles: Solid Metal. Castors: Corner brace style furniture castors. Locks: Optional locks can be fitted on request. Available in the following veneers: Beech, Maple or Limed Oak.